Long before the dawn of recorded history, inhabitants of Earth have been influenced and inspired by Luna—the true name of our planet’s largest natural satellite. Until the early 17th century, it was the only moon known to exist, but now, hundreds have been found. Jupiter and Saturn alone have over 100. Even the dwarf planet Pluto has several. The basic point is: moons don’t seem to be the exception, but the rule. Of the 9 primary planets, only the two innermost planets—Mercury and Venus—don’t have them. It stands to reason that they exist beyond our small corner of the galaxy. To find planets, astronomers rely on a few different techniques. One of the most common is called the radial velocity method (otherwise known as Doppler spectroscopy). To summarize, it monitors the spectral lines of stars, watching for changes in frequencies. However, given the challenges already presented (after all, it is distance reliant), it would prove wholly ineffective for exomoon hunters. Specifically, the combined effects of both objects—the planet and its moon(s)—would make them indistinguishable from one another…appearing as a singular entity instead. Alternatively, there is the transit method: a technique that entails scouring the sky looking for blips in a star’s luminosity—changes that could indicate that something (say, a planet) is obstructing a little bit of light. Astronomers posit that exomoons could appear if we look closely, but naturally, it would come with its own set of limitations. Stars are so incredibly large and bright, planets hardly register in comparison. Therefore, the blips in light are typically minuscule. Now, imagine how much light an object only a fraction of the moon’s size would obstruct. As of now, no definitive proof has emerged. However, there are a few candidates. One, from the J1407 system, is located around 400 light-years from Earth, and is believed to have 80 percent of its mass. 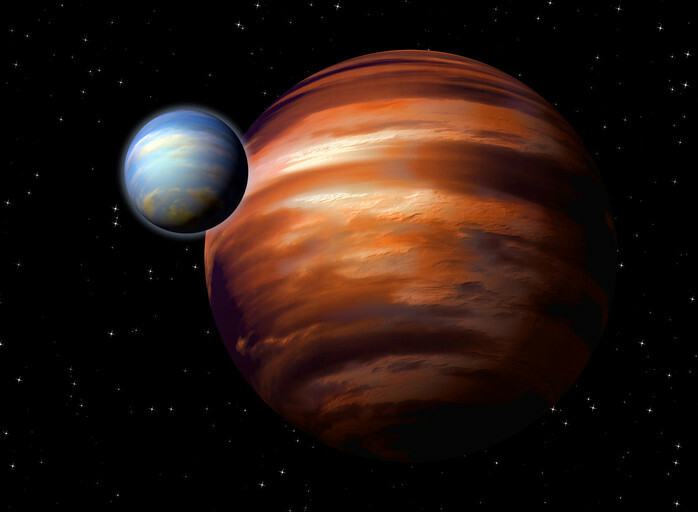 Of course, one interpretation of the evidence yields a much different conclusion: that we are dealing with a binary system (a brown dwarf, or a ‘failed star,’ and a smaller planetary companion)—not an exomoon. I suppose that hinges on the core definition and size requirements for objects that straddle the line between planet and moon. Wasp-12b—the infamous exoplanet that’s basically hell incarnate—is another candidate. Some astronomers suggest that some of its strange characteristics may, in fact, indicate that it has its own moon. Ultimately, neither of these candidates are particularly promising. 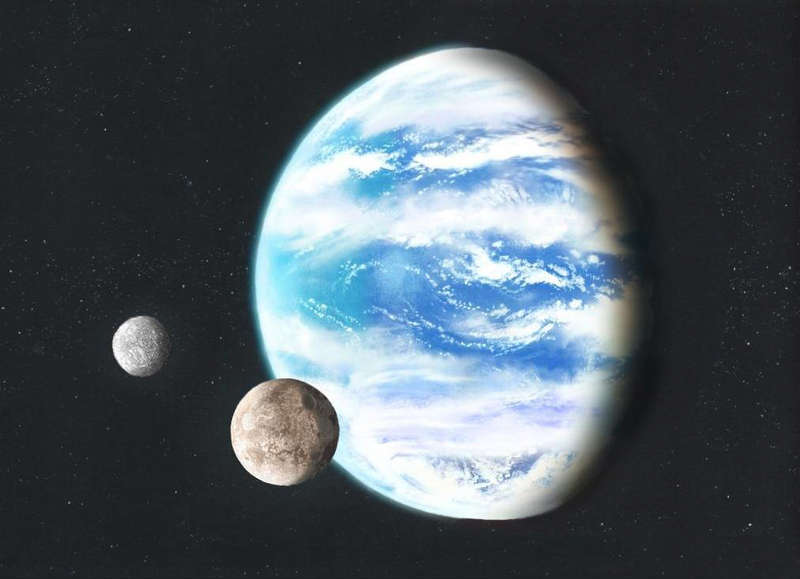 Still yet, one might be the first known exomoon. First discovered back in 2011, and described in a paper dating back to 2013, the candidate was found using a microlensing event—whereby a distant object is magnified by the distortion of spacetime predicted by Einstein. Observations revealed that the brightness of the lensed star increased 70 times over, followed by a smaller discrepancy. This, to them, could be the work of an exomoon; The same rules must still be applied (meaning, the cause and effect might have nothing to do with it). Astronomers have already upped the ante with the “Hunt for Exomoons with Kepler” (HEK) initiative. They believe that by searching through Kepler’s data archives, exomoons may pop out. So our search has just begun.